The most famous Japanese aircraft of the Second World War is undoubtably the Mitsubishi A6M Zero-Sen fighter, code named Zeke by the Allies but more popularly known by its Japanese name of Zero. (Note: The Japanese designation A6M means A=Carrier Fighter, 6=6th in the carrier fighter series, M=Mitsubishi). Built as a land-based, carrier borne and even as a seaplane, the Zero was truely a fantastic plane. The plane was designed by Mitsubishi to a 1937 Navy specification for a carrier aircraft. It first flew on 1 April 1939 but was no April Fool. Mitsubishi and Nakajima built 10,937 of the 11.0 metre wingspan, 9.0 metre long Zero. Different models of the Zero were armed with various guns, but a common setup was two 20mm cannons in outer wings, two 12.7mm guns in the fueslage. It was powered by a single engine, a common one being the 925hp Nakajima NK1C Sakae 12 14 cylinder two row radial engine giving a maximum speed of 570km/h and a range (with drop tank) of about 1920 km. The Zero was used in all theatres of the Pacific war, its most famous role being as part of the attack on Pearl Harbour in December 1941. In the early stages of the War the Zero was almost unstoppable, its manoeuvrability and range making it far superior to any Allied plane. After the Battle of Midway, the new Grumman F6F Hellcats and Vought V-166B F4U Corsair (possibly the greatest combat aircraft of all time) of the US Navy finally took control of the air. There are a number of Zero fighters that can be seen throughout the Pacific. See the aircraft page for details of the others. At Gizo in the Solomon Islands there is a Zero right off the main market area, in line with the Catholic Cathedral. 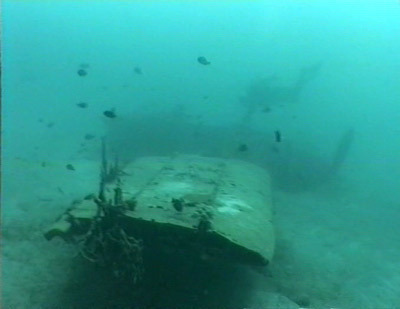 Located at a depth of 8 to 10 metres, the main part of the plane is upright on a sand bottom. It does not appear to have crashed in this location as there is no apparent accident damage (eg the prop is not bent nor is anything else that would be expected to occur from a crash) and there are no apparent holes in the wings or fuselage. Perhaps it was dropped off a ship or wharf at the end of the war? The fuselage is broken behind the cockpit and the tail section is upside down. The landing gear appears to be down and the port wing is buried in the sand. The starboard wing is cracked and the tip is broken. This would appear to indicate that it the damage occurred when the plane was put in the water. There are no guns or instruments, leading to the view that the plane was deliberately put into the water. Only one blade of the propeller is showing. This plane is usually done as a third dive using remaining air from a tank. This will easily b e enough to see and examine the plane. You can also snorkel it.